F3 MFG makes about 20 truck bodies per week that it ships from its Waterville factory throughout the United States. 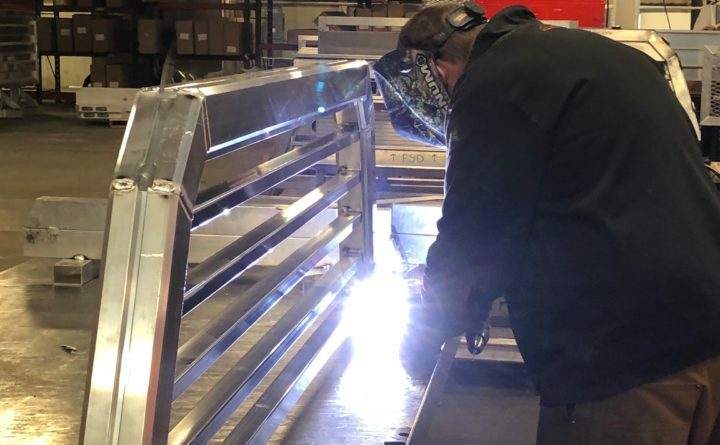 Worker welding an aluminum truck rack at F3 MFG's factory in Waterville. Aluminum truck bodies made by F3 MFG of Waterville weigh about 40 percent less than steel truck bodies and last longer. 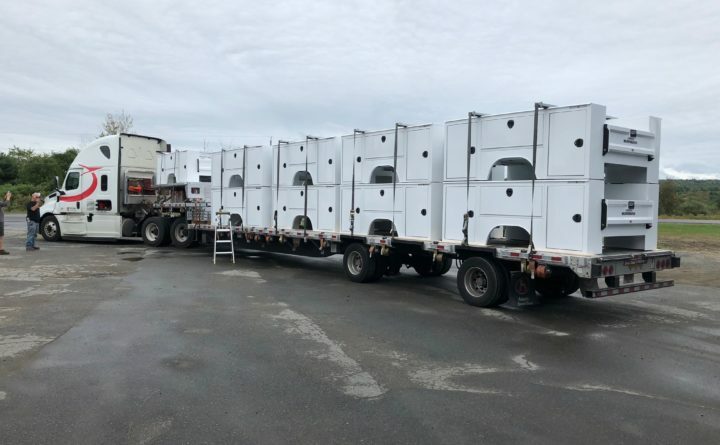 Aluminum truck bodies made by F3 MFG Waterville being shipped from the Waterville fctory. Exit 124 of Interstate-95, added in 2017, had helped the company move product faster. 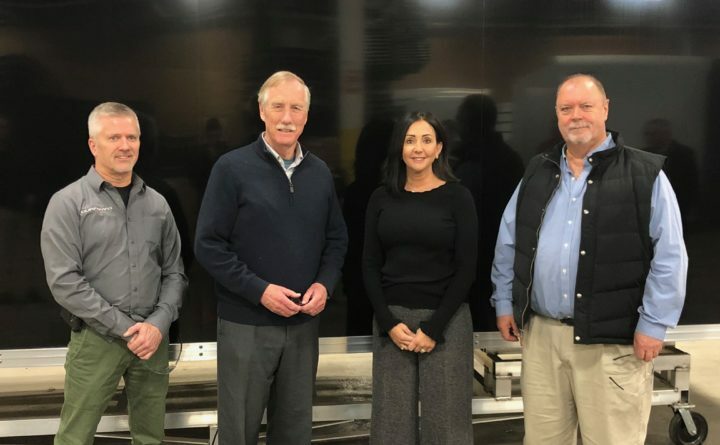 Sen. Angus King visits F3 MFG and the Trafton Road area development in Waterville in March 2018. From left: Owner Bill Cleaves, King, owners Joyce Galea and Tom Sturtevant. 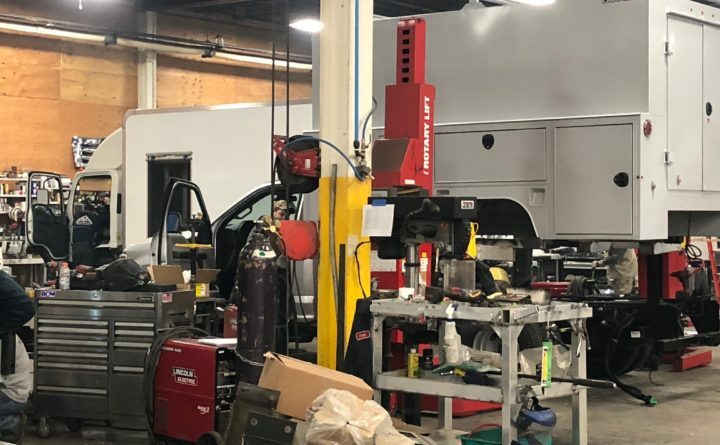 A truck body manufacturing company in Waterville is growing rapidly as demand grows for lighter weight and more durable aluminum parts. 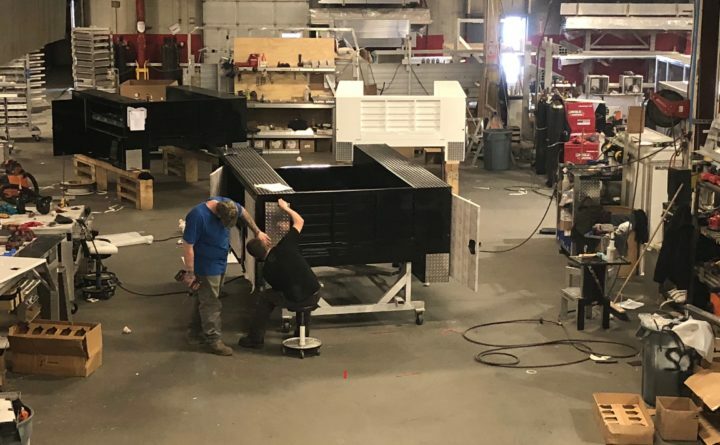 F3 MFG Inc. of Waterville, which makes aluminum truck bodies and headache racks that dealers add to trucks, plans to hire about 40 people to its current workforce of 162 by the end of this year. That’s up from 14 workers in January 2016 after the company reformed from the former Magnum Manufacturing. It also plans to pull in $32 million in revenue by the end of the year, up 50 percent from $19.5 million in 2018 and $10.7 million in 2017, said Bill Cleaves, one of three owners of F3, which stands for “Final 3,” a nod to all three owners wanting this to be the last company they own. Cleaves started Magnum in three buildings totaling 11,000 square feet in Liberty in 2009. He took on two partners with manufacturing backgrounds in the fall of 2015. Joyce Galea, who directs sales, and Tom Sturtevant, who handles accounting, joined Cleaves, an engineer. The owners moved the company to Waterville in January 2016, as that city is close to all of their homes and convenient to the interstate. F3 moved into 50,000 square feet in the former Wyandotte woolen mill in January 2016, and expanded twice since then to now occupy 152,000 square feet at 977 West River Road. There are three unrelated businesses in the former mill. “They were the third fastest-growing company in the state of Maine for 2018,” said Garvan Donegan, director of planning and economic development at the Central Maine Growth Council. That ranking was determined by the Inc. magazine 2018 list of the country’s 5,000 fastest-growing privately held companies. Donegan said the area where F3 is located near Trafton Road has been bustling with activity since the new Exit 124 on Interstate 95 was completed in 2017. “The interstate exit helped us to grow and move product in and out quickly,” Cleaves said. Trafton Properties, which owns the Wyandotte mill where F3 is located, also is building a new 120,000-square-foot commercial building abutting it, Donegan said. F3 makes the DuraMag line of truck bodies that includes service, landscape, hauler, platform, van, dump, custom and anti-rattle stake bodies. Those represent 75 percent of sales and are sold through F3’s U.S. network of 180 dealers. The F3 service bodies, which are the highest growth area for the company, have an average price of $7,500, but range from $5,000 to $25,000. They are used in the back of the truck by carpenters and electricians. It also makes the Magnum line of truck racks, which represent 25 percent of total sales. Half of the racks are sold through the internet and half through dealers. In Maine, the company sells through Hews Company, a South Portland truck upfitter, and Bangor Truck Equipment. F3 intends at some point to expand internationally, but Cleaves said it currently is busy with North American sales. The primary competition is Reading Truck Body in Pennsylvania, which sells some aluminum as well as steel products. Cleaves said he expects truck bodies, upward of 80 percent of which are made of steel, to be switched to primarily aluminum during the next 10 years. He said aluminum is 40 percent lighter than steel, and the price for aluminum in most products is getting close to that of steel counterparts. “The trend is for bodies to be less weight and more corrosion resistant for longer life,” said Bob Hews, president of Hews Company. He pointed to the popular Ford-150 pickup truck. Ford started selling some aluminum versions of the truck in 2015, touting fuel efficiency because of the lighter weight than steel trucks. Hews said that recent price fluctuations from tariffs are not hampering sales of aluminum bodies to customers who value its lightness and longer life. President Donald Trump’s administration in May 2018 imposed 25 percent tariffs on steel and 10 percent on aluminum products imported from the European Union, Canada and Mexico. “Going forward, I expect 25 percent to 50 percent of our sales to be aluminum bodies,” Hews said. “We continue to build sales of the F3 product.” However, he admits that online sales by F3 direct to customers are difficult for him to compete with. Cleaves said the tariffs on steel and aluminum are not affecting his business because he buys aluminum in the United States.